Back last month we took a trip to Glacier National Park. Everyone's heard of it, right? But most people think of the one in Montana, USA. Well Canada has a Glacier National Park too! And it's right here in British Columbia! It's about a 3 hour drive from us here so we packed up the car with a tonne of camping stuff, a dog and 2 people and headed off. We stopped briefly en route in Revelstoke to stock up on some last minute provisions and a bite to eat since we'd be arriving after dark and too late to start cooking. We set up camp for our 2 night adventure at the Illecillewaet campground just a couple of km's from Roger's Pass, right on the side of the Trans Canada Highway. You'd think that the traffic noise would be distracting and ruin the 'in the moment with nature' and you'd be right, except for the raging river noise that drowned any other noise out - Illecillewaet means 'Raging Waters' in First Nations-speak! This was no babbling brook that's for sure! Saturday morning was a slow start. It was a pretty chilly morning for us initially, but as soon as the sun appeared over the surrounding mountain-tops it warmed up (and reached a nice, comfortable high of around 23-25 which was perfect hiking temps!). I love waking up in a new place that you arrived at in the dark - You're never really sure what it all looks like until you see it in the daytime! We took Meli for a walk arouond the campsite and headed along the campsite road a little so she could have a chance to run off-leash (that girl isn't exercised unless she's had some off-leash time! ), we paid our camp dues, went to the visitor centre to pick up some trail maps and chatted to a ranger and generally took out time getting our stuff together for a nice long hike! We finally set off on the Asulkan Valley trail around noon. 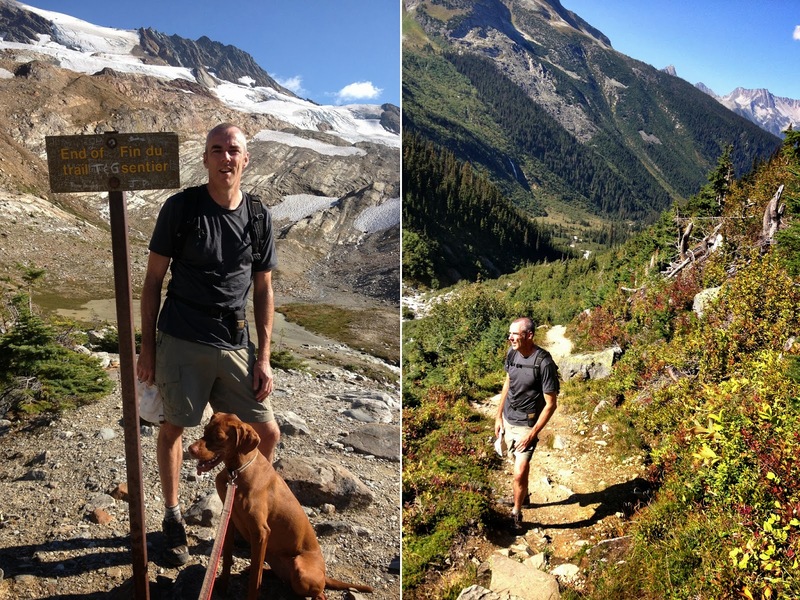 It was billed as a 13.8km trail with around 2100 feet of elevation gain and would steepen after 4km....as were all the trails at this time of year it was a strict pets-on-leash area due to bears in the area. Our girl isn't the greatest on a leash so this was gonna be a looooong 13.8km!! The trail started through some gorgeous old growth forest, following the river. Very green, mossy and easy underfoot. We crossed the river a couple of times on small bridges and caught glimpses of waterfalls high above us tumbling down the valley sides. As we climbed the forest thinned out and it got rockier. As promised the incline increased dramatically after about 4km. It was at this point I was rather glad of am energetic and exuberant puppy tethered to me - her constant pulling on leash that is normally a pain in the backside was welcome assistance, literally pulling me up! Good job Meli-mou!We weren't able to see where we were headed exactly and we encountered several false peaks and even thought we'd seen a hikers cabin which never materialized!! As our GPS read 7km there was still no trail-end in sight! What turned out to be the final 1km was along a knife-edge climbing incredibly steeply up towards the glacier and finally, finally we saw a 'End of Trail' sign and the Asulkan Hut. It was a welcome relief and the the views were spectacular. It was mountains for miles, and glaciers above us, and even a glimpse of the thin ribbon of black-top as the Trans-Canada snaked its way through the pass way, way below us. There was a small, mountain stream and an open area where the water collected in shallow pools before tumbling down the mountain so Meli was able to have some crazy run-around time cooling off in the water whilst we ate our lunch. The journey down was tougher - steep downhills on loose rock is never fun, and to prevent a serious spill we had to keep Meli off-lease for the first couple of km`s till it started leveling out - pulling downhill isn`t quite as appreciated as the uphill version was! Since it was getting later we lost the sun once we descended back down into the valley and the mountains crowded around us. It added an eerie gloom to the hike and we were keen to get back to camp and not see any hungry bears. 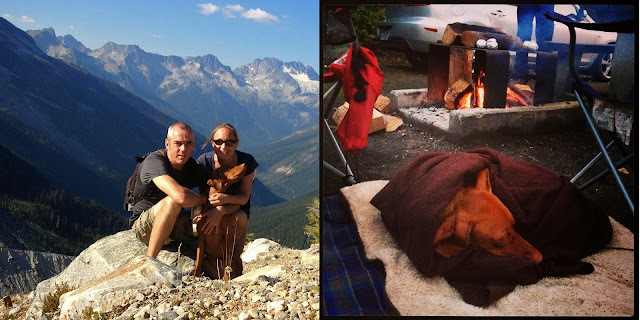 Back at camp we finally discovered what it takes to wipe out our baby girl - the Asulkan Valley hike! We pulled her bed out next to the campfire and she curled up and slept the evening away! We enjoyed our fire and a few bevvies and a late BBQ supper before heading to bed ourselves! Our second day we took a nice, leisurely stroll along the abandoned rail-bed from the old Glacier Hotel. It was about an 8km out and back route and obviously nice and flat - it was perfect to loosen up those stiff limbs before crunching ourselves back up into the car for the journey home! We were so lucky with the weather - we tried this trip 2 years ago and got washed out so this was the perfect weekend a long time coming! The hikes we picked were gorgeous and the views were to die for! The Illecillewaet campground is the trail head for quite a number of hikes in the park so it was a perfect base-camp! 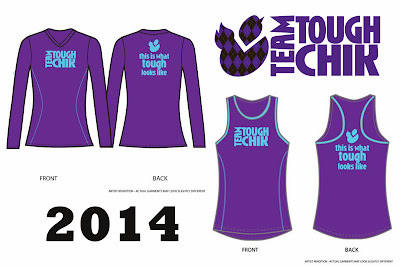 Team Tough Chik & Ragnar SoCal! I'm back for a second year! I've loved being a member of this great online team of women, across the US and Internationally. In 2013 there were 240 of us, and most of our interaction was via a friendly, fun private Facebook group. I'm the sole BC representative this year so my opportunities to connect in person with fellow team members were slim, but yet I still managed to meet one lady - Hi Phyllis! at Fitbloggin` in Portland. I love the way it's reason to connect! I'm especially excited for the 2014 year of membership since I'll be meeting at least 11 other team members and getting to know them intimately as we squish ourselves into a couple of minivans for 36 hours with little to no sleep over the course of 200 miles as we take on the Southern Californian Ragnar Relay! 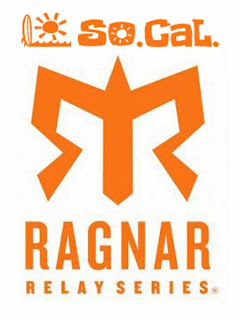 Running a Ragnar has been on my bucket list for some time now. 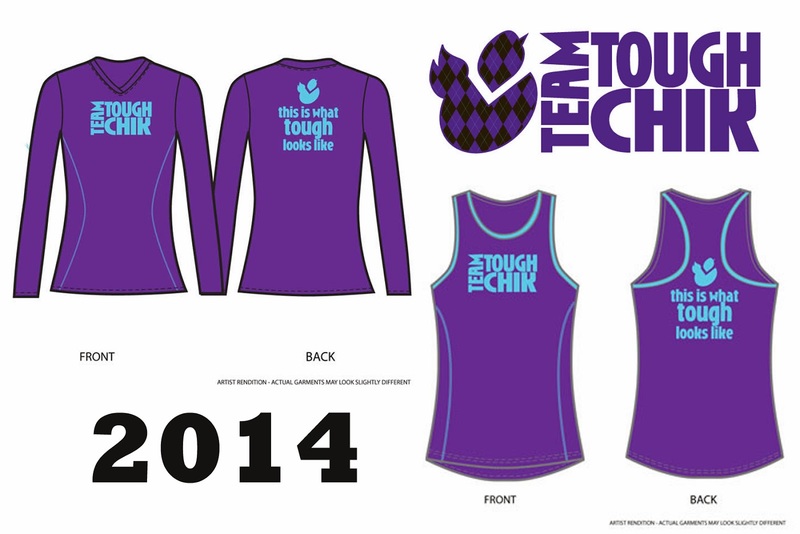 There are dozens of these ultra relays taking place across the country and I wasn't fussy about which one I'd want to do, so when Shannon reached out and asked if there'd be interest in putting in a Tough Chik team I was so on board! I`m linking up this week to Jill`s Fitness Friday! It is said that the Liebster award was created to recognize and/or discover new bloggers and welcome them to the blogosphere. In the digital world of the internet, this seems like a nice gesture! 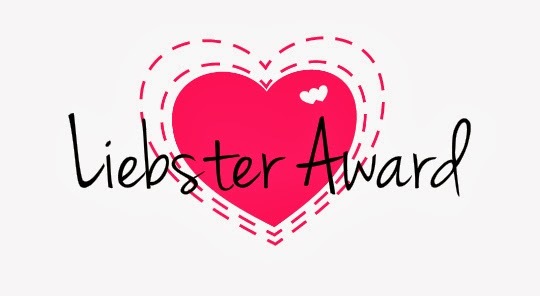 Answer the questions provided to you by the person who nominated you. So, now all the 'official stuff' is done with, here's the fun bit....Sarah set some AWESOME questions! You must choose three things to take to a deserted island – what would you take? - My iPhone, a cell phone tower (because, duh!) and a generator (to recharge it!) Because, sad as it is to admit, My phone is pretty integral to so much of my life these days - it's my phone (obviously! ), my camera, my photo albums, my GPS, my run-keeper, my blog reader, my e-book reader, my compass, my encyclopedia my alarm clock, my cooking timer....you get the picture right?! What is your favourite song? - Purple Rain by Prince - always has, always will be. Back since my school days, it's the best track to crank up the volume! Happy or sad times, either works! Who is your best friend? What is he/she like? - My husband Chris, I guess he's pretty OK ;-) Can't boost his ego too much! Where was the last place you went on vacation? - My last 'BIG' vacation was China in Feb 2012, but since then we also went back to England for Christmas to visit family (and so I don't really consider that vacation! ), plus several trips to the States - Idaho, Montana, Washington and Oregon so lots of mini vacations this past year. 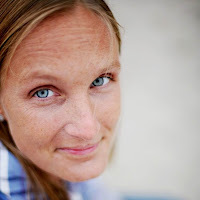 Chris from InSpiral Coaching - because he's my husband and I think his blog is awesome! Anna from Your Healthy Place - Lots of delicious recipes and great articles on emotional eating. I had the pleasure of meeting Anna and her Mom just last month and we're currently trying to persuade Anna that living in the Okanagan is the best! Meghan from Little Girl in a Big World - I've followed Meghan's blog for a while. She's just signed up for her fist Ironman so I'm looking forward to following her journey! I want to like cycling and swimming as much as Meghan does - then I might actually do a triathlon! Sharla from 262milejourney - A fellow Fitbloggin' attendee! Though I'm not sure we connected in person at the event, I've been following her blog and instagram feed ever since! Sarah from theunbuyersguide - Sarah is a fellow biker-chick! We'll usually be found perched on the back of our man's motorbikes on long rides to Idaho! She's currently on a one year spending fast! And you guys get to answer the following questions if you're game! Which country would you choose to live if you had to leave your current home country? What habit would you like to break? What's the most physically demanding activity you've ever done? Would you rather be in trouble with your Boss, your partner or your Mother? What was the last single-item purchase over $100 you made? What historical event would you most like to witness? If you had a 60-second dash, unlimited shopping spree (exempt from spending fast rules Sarah! ), which store would you choose to be in?! Last Sunday was my final race of the year. In years past it's been my annual 'goal race', and it was the first Half Marathon I did 4 years ago. I think it will hold a special place in my racing calendar...it's my hometown race, it's got beautiful scenery, the finish line is right next to the lake shore, it's a fast and flat course, and on Thanksgiving weekend here in Canada the temperatures are usually perfect for running. I skipped the event last year, choosing instead to fly to Illinois to run the Chicago Marathon, so this year I was looking forward to getting back to Kelowna! Since running the Kelowna Wine Country Half last month I haven't really been all that tuned-in to running. The mornings are darker now, and with a big office move, numerous projects and my family visiting from England I just didn't seem to carve out time in the day (which is why I always run in the early morning, before the excuses set in!) I managed 2 short runs this week - a 4 miler and a 3 miler and I felt slow, uncomfortable and heavy, really heavy..Ergh! I was not expecting great things for this race, so I just hoped I'd get a sub 2-hour once again, and finish the season in style! This was the first time I've run the race in the dry. That could've been a bad sign for me, since I joke that all my PR's have been set in the rain, and until Sunday I hadn't run the Okanagan Half in the dry! It was however colder than usual, with temps around 4 or 5 degrees at 7am. Lines for the porta pottys were chronic and for the second time at this race I was still lining up when they played the national anthem in preparation for the start of the Half. With seconds to spare, my warm-up consisted of a quick sprint across the sports pitch to the start corrals and I luckily managed to duck in just ahead of the 2 hour pace bunny which was perfect. The moment I ran through the start line and out of the park, onto the course I felt GREAT! The air was fresh, but invigorating and I felt so alive! And I just felt comfortable, from the moment I set off! (rare indeed - it usually takes me a couple of miles to settle down). And so was my race. What can I say, I loved every moment of it. I felt strong and fast and awesome! (and so very different to those little training runs earlier in the week!). My Nike + app doesn't give me the pace I'm actually running, rather that at each mile I get the overall average pace. Of course that's easy on the first mile and I ran an 8:13. At the second mile the average increased to 8:15 (which afterwards I can see I ran an 8:18), then the third mile it dropped down to an average of 8:11 (which meant that I'd run quite a bit faster to have brought the average down over 3 miles and indeed after the fact I can see I ran a 7:58 which was my fastest mile of the race). After that 3rd mile I settled into an average of around 8:11-8:15 and felt comfortable and confident that this was going to be a good race for me! At the 11 mile marker I reasoned with myself that I could do anything for 18 minutes, so just kept on going. I could do this! As I turned into the finishers chute I could see the clock was 1:51:? ?, I found a shred of energy and sprinted the last 50 yards knowing the clock was most definitely under 1:52 and I'd just scored my second PR this year! Chip time 1:51:10! Another 2 minutes off my PR from May this year! And I knew I'd pushed hard and deserved it! It took a little longer than usual to find Chris. Only because he wasn't expecting me to finish quite so early! But he'd also just scored a fabulous result in the 10km - his best time in 15 years with a 44:27 and second place in his age group! Woot-woot - Go Chris! So once again I'm left wondering what did I do to deserve this result - this new PR of mine? And honestly I'm not entirely sure. I admit I don't follow a training plan, I don't do speed work, I don't do many hill repeats. I do know that I've been having a conversation with myself about discomfort and burn - I think a lot of times in the past I haven't physically over-exerted myself. But this year I've got more comfortable with being uncomfortable. I ask myself 'what hurts'? and usually the honest answer is nothing. So I continue to push.